Microsoft plans to double the number of promoted apps that appear in the Start menu with this summer's big Windows 10 update. The Windows 10 Anniversary Update—also known by its codename, Redstone—will bring with it plenty of welcome new features. Improved Cortana, a new dark theme, and a bolstered Edge browser are all things to look forward to in update, which arrives this summer. One addition you probably won’t be looking forward to, though, is more ads. According to Neowin, a slide deck published to one of Microsoft’s developer sites shows that the company plans to double the number of promoted apps that appear in the Start menu by default. Currently, the Start menu has slots for five promoted apps; the Anniversary update will increase that to ten. A slide that shows all the promoted apps tiles in the Windows 10 Anniversary Update’s Start menu. Clicking a promoted apps tile will take you to the relevant page on the Windows Store, where you can purchase and download the app in question. The number of installed apps that appear by default will drop from 17 to 12, Neowin notes. Since Windows 10 launched, however, Microsoft has gotten more aggressive and in your face with its in-Windows promotional tactics in order to push products onto its users. The company has perviously used pop-up notices on Windows 7 and 8 to get users to upgrade. 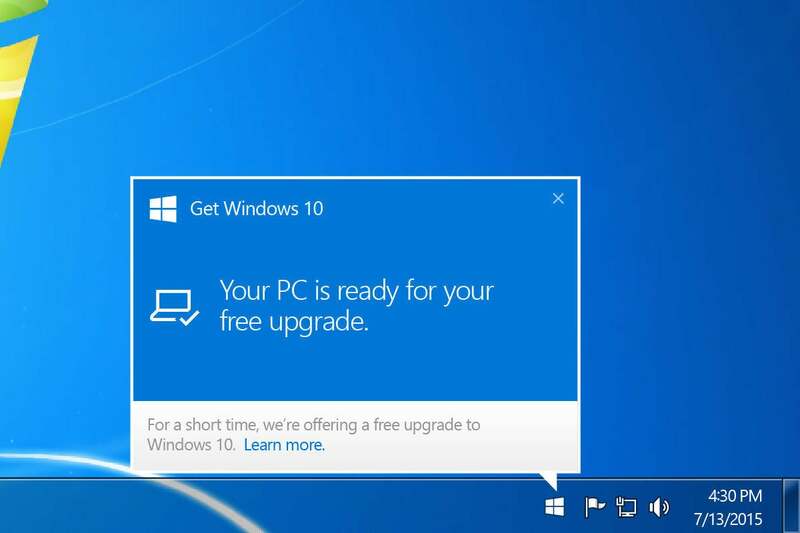 The pop-up alert Microsoft employed to convince WIndows 7 users to upgrade to Windows 10. Annoying. More recently, it employed what can we could only describe as “malware-like tactics” to promote Windows 10, like in-your-face pop-ups that give you no obvious way to opt out of downloading Windows 10. The additional promoted tiles in Windows 10 seem to be a continuation of this trend. At least you can easily remove these promoted apps tiles, as Neowin notes—all you need to do is right-click them and unpin them, and you can readily remove any such apps that you do install. But that’s beside the point. I get that Microsoft wants to guide users to the Windows Store, and there’s nothing inherently wrong with promoting apps in the store when done appropriately. But it seems like Microsoft is treading down a bit of a dark path here, and annoying users in an era in which the PC is playing a smaller role in many people’s lives doesn’t seem like a winning proposition. Disclosure: The author of this article provides copywriting services to TechSoup, a nonprofit organization that works with Microsoft and many other technology companies to provide nonprofits with technology products and services. His role at TechSoup does not influence his work for this publication.